Jed Fraser, an Aboriginal student ambassador, hopes to inspire others to succeed. I am a proud Aboriginal man coming from the Bidjara and Mandandanji clans from South West Queensland. I am very passionate about supporting Indigenous education and health, and as an Indigenous person who was lucky to go to a good school and that has a different pathway into university, I feel I am obligated to do my part for my people. If I can help one kid get to tertiary education and inspire, then I can live happy. 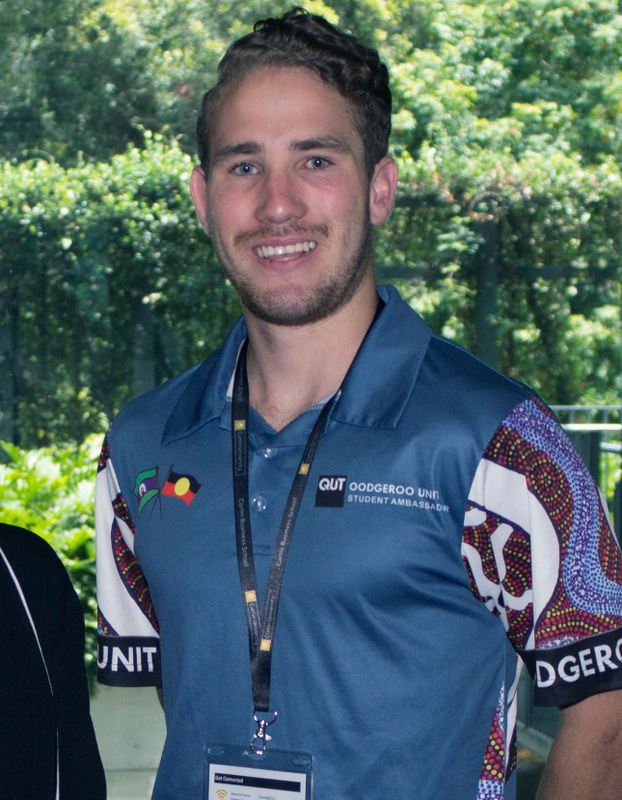 I am currently studying a Bachelor of Exercise and Movement Science at Queensland University of Technology (QUT) and am a Student Representative Committee (SRC) member for Indigenous Allied Health Australia (IAHA); the Indigenous Officer for the QUT Student Guild; Explore Uni Ambassador; Oodgeroo Unit Ambassador; Indigiso (Indigenous student society) co-founder and Vice-President; World Indigenous Peoples Conference on Education (WIPCE) presenter; and Beyond the Broncos mentor. I went to high school in Yatala, studying prevocational maths, English communication, physical education, hospitality, and technology studies in my senior years, as well as doing a school-based apprenticeship as a chef. I really enjoyed physical education and hospitality. I also enjoyed going to school to play sports and the social aspect of seeing my friends, but really struggled with motivation. As I was undertaking an apprenticeship, I didn’t feel that I needed to go to school or complete my assessments. Luckily, I had two teachers and my parents who really helped me; plus, Mum and Dad made me stay at school. After I graduated, I quit my chef apprenticeship as it wasn’t the career path that I wanted to stay with. I went to Brisbane TAFE in 2014, studying a Certificate IV in Fitness and a Diploma in Sport Development, but midway through 2014, I started to aspire to go to university. I remember talking to one of my old teachers from school (as I worked at the school as a sports coach). We were talking about what I would do once I finished my diploma at TAFE, and he was encouraging me to go to university. At the time I didn’t feel I was smart enough, and that university wasn’t realistic, but he told me that I could do it, and that I am smart. Having someone tell me this really motivated and reassured me. At the time, I wanted to be a secondary physical education teacher therefore I needed to go to university. However, my career aspirations have, and continue to, change. I first became aware of the HEPPP funded programs available to assist students through the Explore Uni program and through the Oodgeroo Unit at QUT. One of the main strengths of Explore Uni, in my view, is its holistic approach; the program gives students a well-rounded view of the importance of education. I also think having actual university students running the program who can connect with the younger students is another strength. The most important personal skill I believe is being able to relate to students. If you cannot connect on a personal level, they can easily lose attention, but if you can make that connection, you can inspire them. My advice to other students in pursuit of success would be to get involved with extra activities whilst at school or in higher education. The opportunities out there are endless, you just got to put your hand up and say ‘yes’. My most significant successes so far would have to be being an SRC for Indigenous Allied Health Australia and having the opportunity to present at the WIPCE in Toronto 2017. However, real success in my eyes is reaching your potential. My personal hope for the future is to continue on studying after I finish my bachelor degree. I also want to start my own Indigenous health program that informs Indigenous students about different health degrees that can be studied. I know I haven’t reached my potential as yet and strive in my everyday life and studies to see what my real potential is. That is true success in my eyes.